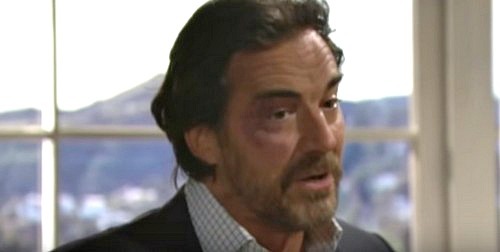 The Bold and the Beautiful (B&B) spoilers for Thursday, March 8, tease that Ridge (Thorsten Kaye) won’t hide his intense anger. During a conversation with Brooke (Katherine Kelly Lang), Ridge will insist that his brawl with Bill (Don Diamont) was necessary. He’ll argue that Bill doesn’t get to obsess about Steffy (Jacqueline MacInnes Wood) anymore. Once the shooting news starts to spread, Ridge certainly won’t be concerned about Bill’s condition. His coldness will leave Brooke worried about what her husband might’ve done. Brooke will undoubtedly as Ridge some tough questions pretty soon. Meanwhile, Quinn (Rena Sofer) will get grilled as well. The Bold and the Beautiful spoilers say Eric (John McCook) will deliver some shocking updates. As Quinn drinks a hot beverage in bed, Eric will drop the shooting bomb on her – or so it seems. There’s obviously a chance that Quinn did the deed and already knows. That’ll definitely be a fear of Eric’s. B&B spoilers state that Eric will explain what happened. He’ll reveal that someone pumped a bullet in Bill last night. Eric will naturally wonder if Quinn has anything to tell him. He’ll hope that his wife’s innocent, but he can’t trust her thanks to her dangerous history. Eric suggested that he recently saw a glimpse of the old Quinn. He knows her dark side would be capable of this attempted murder. Quinn will assure Eric that she had nothing to do with this. She’ll try to put his mind at ease, but she’ll admit she’s not upset about Bill’s fate. Quinn will believe he had it coming! Over with Rick (Jacob Young), he’ll make a harsh declaration. Rick will indicate that there’s a “special place in hell for Bill Spencer.” He’ll suggest that the quicker Bill gets there, the better off everyone else will be. The Bold and the Beautiful isn’t holding back on all the threatening statements and potential clues! Finally, a hungover Wyatt (Darin Brooks) will awaken to a plenty of texts and voicemails. He’ll read what he missed from Katie (Heather Tom) and discover that his father’s near death in the hospital. Since Wyatt will have no memory of last night, he’ll fret over the possibility that he tried to kill Bill. It sounds like another hot episode’s on the way. We’ll keep you posted as other B&B details emerge. Stay tuned to the CBS soap and don’t forget to check CDL often for the latest Bold and the Beautiful spoilers, updates and news. The Bold and the Beautiful Spoilers: Epic Baby Bill Moment – B&B Scene of the Year!